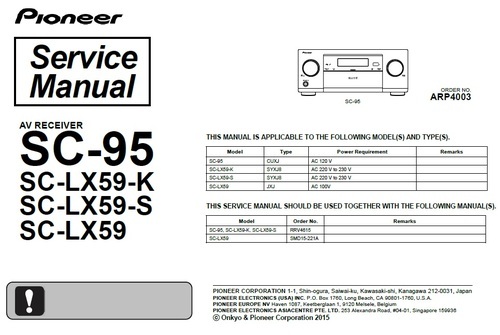 Attention , Pioneer said : This service manual should be used together with the following manuals: SC-95, SC-LX59 RRV4615 and SC-LX59 SMD15-221A . These manuals does NOT included to that download . The SC-95, SC-LX59 RRV4615 supplement Service Manual sell it separately . You can buy the supplement RRV4615 as : Pioneer SC-95 and SC-LX-59 RRV4615 Supplement Service Manual for $14.95 .